The department received the Community Traffic Safety Platinum Award through AAA East Central. Annually, this automotive service awards police departments in northeast Ohio, including Lake, Geauga, Cuyahoga, Ashtabula and Trumbull counties. This year, 118 law enforcement agencies were eligible and from 118, 50 were awarded and only 18 were given Platinum status. Geneva Police Department was the only department in Ashtabula County to be awarded. There are four categories of awards that can be received: Bronze, Silver, Gold and Platinum. Geneva Police Department was awarded the highest award, Platinum status, that is given to “Commendable Leaders” for the safety efforts and enforcement procedures dedicated toward making communities a safer place. “Officers really have to go outside the norm to acquire a Platinum Award,” said Chief Greg Wiley, who has been a part of the department for over thirty years. The award was made possible because of the accumulation of all the campaigns that are currently held at the department: Drive Sober or Get Pulled Over, Click it or Ticket, the Smart Helmet campaign and Safety Town. Special recognition goes out to two officers that heavily facilitated a few of the programs, Officer Rodger Wilt and Officer Sean Gonzales. Officer Wilt assisted with scheduling and statistics calculation with the Click it or Ticket and Drive Sober or Get Pulled over Campaign. Starting on Memorial Day and Labor Day respectively, officers are responsible with completing daily activity logs which are then sent to the Ohio State Highway Patrol where tallies are made locally. The logs include eight categories the officers are held accountable for, including violations in seatbelt usage, suspended driver’s licenses or lack of driver’s license and speed. “This is about education, not just us giving a ticket. This award is about showing the community that we are out there involved in community policing and community traffic safety,” said Chief Wiley. Officer Gonzales focused on the success of Safety Town and the Smart Helmet campaigns. Around fifty children were involved with Safety Town, and approximately 15 helmets remain from the 100 helmets the department started with. “I am really proud of our guys. We went up against municipalities of a much larger population like Euclid and Mentor, but our officers are knocking it out of the park,” said Administrative Assistant of the Police Department and Law Director Dolores Allen. The officers within the department benefit being out in the community, too, by working with the public effectively. “We always look for ways to work out in the community. We want to be a part of the public. Our officers want to be out there,” said Officer Wilt. 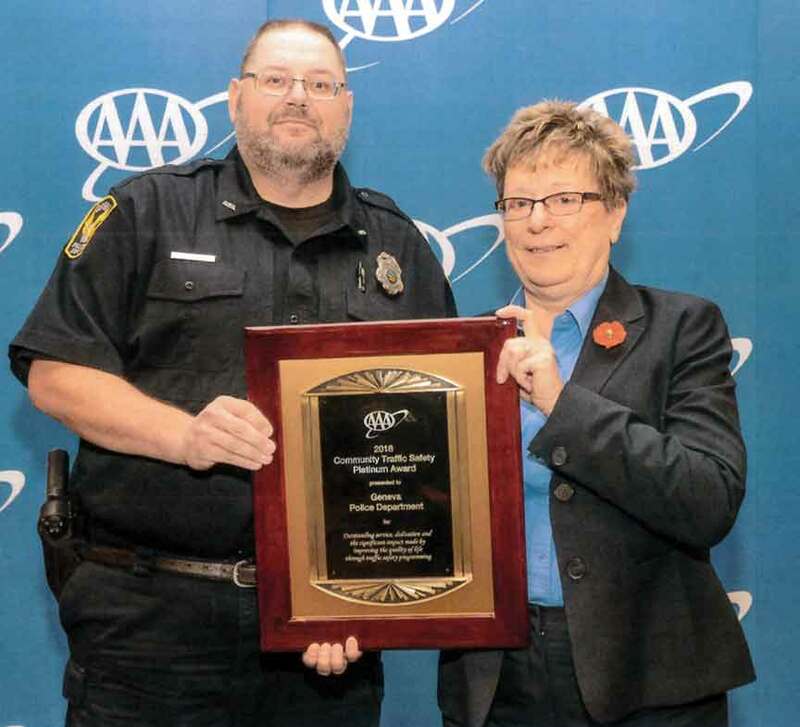 Officer Rodger Wilt (left) accepts the Community and Traffic Safety Platinum Award from AAA East Central Safety Advisor Lori Cook.